The experience of all 24/7 techs at Electric Garage Door in Oakville ensures safe systems. We install and repair electric openers and parts with efficiency. Garage Door Installation Oakville will always find the best solution for your needs. Some companies say much and do nothing. They promise a lot, but they deliver a little. Garage Door Repair Oakville will never do less than promised; on the contrary, it will always give you more because our excellent services can keep you secure and safe. That’s our goal. As part of the beautiful province of Ontario, Oakville is a great suburban city, which has a heritage on sports and is distinguished by fabulous jazz festivals, but these interesting events are enjoyed only when you know that your home is secure. 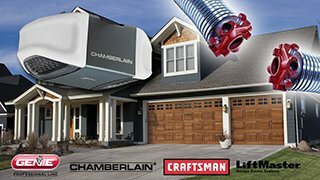 Did you know that your garage door is comprised by over three hundred parts? Our technicians know each and every one of them and are trained to put them together, repair them, install them or replace them. Today, garage doors are small technological miracles. They detect obstacles, close automatically in case you forget to do it yourself, open automatically if they sense high levels of carbon monoxide and operate just by pressing a button. Some doors are also connected with the general security alarm system of the house and the remote controls are made with rolling code technology, which alters your security code each time you operate your door. If you have an older garage door manufactured prior to 1993, you should replace it because since then the rules and safety regulations have dramatically changed. If you cannot afford a replacement at this point, you may still consult our professional experts about an update that will increase home security. If you want to buy a new garage door, you should consult our garage service. Our experts will explain the technical differences between your options and you can select the one that best matches your wallet and needs. Garage Door Repair Oakville will always have the best solutions for you and your property.